Depending on what your sleep arrangements are like, you might be one of those who need to wear earplugs to get a good night’s sleep. Maybe you have a partner that snores or maybe you’re living in the middle of a construction zone. You could be one of those people who sleep so lightly that a fly breathing wakes you up or the party down the street is just a touch loud tonight. There are several ways to deal with excess noise when you’re trying to get a little shut-eye. Some people leave a fan running or use a white-noise machine. Some need to have specific music or an eye mask. Then there are those people who must have a pair of earplugs in to get some shut eye. The question then becomes, is that healthy? Never put anything smaller than your elbow into your ear” is something we’ve been wisely cautioned against at some stage or another. But more of us are ignoring this advice. We use in-the-ear-headphones to listen to music, car keys and hair pins to scratch that particularly unpleasant itch, and hearing aids to enable better communication. 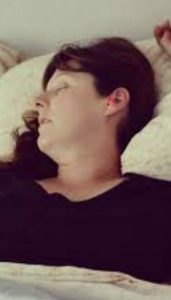 Many of us also use disposable foam earplugs to protect from damaging noises in the workplace, or to block the noise of snoring partners, loud traffic outside bedroom windows, dogs barking and any other bothersome sounds that prevent a good night’s sleep. If you regularly use earplugs to sleep, is it damaging? On the internet, people ask whether doing so can cause tinnitus, infections or ear pain. Can regular earplug use cause wax or pressure build up in the head? Can it cause headaches? To answer these questions, I should first explain a few things about ear wax. Wax is good for the ear but too much can be bad for you. Wax comes from small glands in the outer part of the ear. It starts off looking like honey but the longer it stays in the ear, the darker and harder it gets as it traps dirt, grit and gunk. Normally the wax will be “walked” out of the ear by its self-cleaning mechanism. Anything that slows down or reverses this mechanism can cause wax to build up. Unfortunately, anything smaller than your elbow can do this, sleeping plugs included. But everyone’s ears are affected differently. An ear full of wax works like a built-in ear plug – great for sleeping, but if it ends up resting on the eardrum, it can cause discomfort and sometimes tinnitus. Most of the problems people associate with earplugs are actually due to too much wax in the ears, although the wax may be caused by being a consistent earplug user. If you are a consistent user and think you may have too much wax, ask your doctor to check inside your ear. Or better still, make an appointment to see your local audiologist. They may have a camera that can show you how much wax actually is inside your ear and whether something should be done about it. A good night’s sleep has many health benefits, and sleeping poorly can have follow-on issues such as concentration and memory problems. Studies have demonstrated the benefit of sleeping aids such as ear plugs and eye masks in improving sleep for patients in hospitals. In fact, the studies show the aids can reduce the need for sleeping medications. The good news is that you won’t wreck your precious ears if you regularly wear earplugs to bed. The trick then becomes proper care and maintenance with said earplugs. Make sure you’re disposing them when they get too gross or it won’t just be snoring that prevents a good sleep. Snoring mouthpiece and anti snoring device blog with unbiased mouth guard reviews. Includes ZQuiet, GMSS, SnoreRX and others.